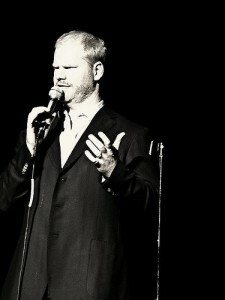 Jim Gaffigan is best known for his hysterical stand-up routine. His material on Hot Pockets and McDonalds are fan favorites. Jim has been in films, television shows, and on Broadway. Now he can add being an author to his resume. 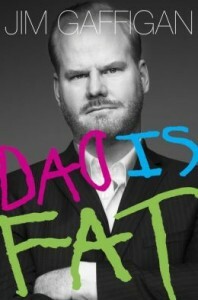 Gaffigan’s book “Dad Is Fat” came out earlier this month. Click here to purchase his book. In his book he explores fatherhood, his relationship with his wife and kids, and being on tour. The book is a great read and very funny. I was able to chat with Jim about where the title of the book came from and how fatherhood has changed him. Art Eddy: “Dad is Fat” is the title of you new book and is it true that one of your kids came up with the title? Jim Gaffigan: Yea that is true. When my seven year old was first learning to write that was his first complete sentence, dad is fat. On the book cover it is actually his hand writing. It was a moment where he wasn’t punching me in the stomach. So it was all good. AE: When people see the title of the book they might think that you are trying to lose weight, but it is just your story about fatherhood. What inspired you to write the book? JG: I wanted to do a book about just being a dad and how I am an improbable parent of five. I am certainly not an expert. So I wanted it to be white and vague. We were looking at different titles. I thought it was kind of funny and captured the chaos of my life and it shows the absence of authority I have in the process of parenthood. AE: I like that fact you didn’t use a ghost writer for your book. Was that very important to you? JG: To be clear I did it with my wife. It was interesting because I had an offer to do a book a couple years ago. I knew I didn’t want to have a ghost writer. I am glad that I waited because often with books or even comedy books there is this motivation of wanting to get a lump sum of money, getting on the New York Times best seller list, or just to say that they did a book. I am grateful that I did not get caught up in that. AE: I have two daughters and people are always asking if my wife and I are going to have more kids. Some people say it gets easier after two. I don’t get the math on that. You and your wife have five kids. So tell me does it get easier? JG: Well I think the biggest adjustment was two kids. At least for me. There is an asterisk next to that because I am a guy who travels a lot doing stand-up comedy. I get this forced one or two break every week. I think it is very fascinating how everyone is really curious about how everyone else is going to procreate. It is baffling! You would never ask someone when they are getting their hair cut. People are consumed with curiosity if a couple is married or dating for longer than six months people suddenly need to know whether they are going to have a baby. It is rude really. I don’t care, but I just think it is funny. I know that we have had way beyond the normal amount of children. People are like are you going to have any more children. I am like why do you care? Are you going to pay for their college? How is that any of your business? This myth of overpopulation that comes from 18th century England that no want to admit is just B.S. Why does anyone else care? It is like don’t worry I am taking care of this. People don’t ask why someone owns two cars. AE: As a father what would you say are some of the most challenging aspects about being a parent? JG: I think it is an ongoing thing of checking in. It is overwhelming the fact that you are in charge of another human being develop. For me it is a constant battle of keeping a balance between work and parenting. I think that we have found a good balance with me doing stand-up. I am lucky enough to do theaters and I can travel with my kids on the tour bus. Even writing this book it took me away from parenting responsibilities that I think are pretty important. There are important things and it is not about going to birthday parties. It is about being there when they go to the doctor and listening to a good dose of the guilt. I think it is going beyond ordering pizza and going to dance recitals. I want to be involved in a certain level. It was interesting writing the book. In the end I remember thinking if no one buys the book at least if my kids eventually ever read it they would say he was thinking a lot about parenting. He was not perfect, but he tried. AE: For your stand-up routine do you try and balance fatherhood with other topics or do you find now that you are creating new material that is mostly parent based? JG: Well when I started about 20 years ago I would see comedians talk about their wife and kids. I remember sitting in the audience going that is great I can’t even get a date. I don’t know what you are talking about. I made it a point never really going beyond in an hour show maybe talking about being a parent or my kids for more than five minutes. I would almost censor myself. I can’t be the kids or parents comedian because there are going to be 20 year olds in my audience or there are going to people without kids in my audience. I always life for my stand-up to appeal to everyone. I intentionally did censor it. I think with Twitter I had an outlet to pump out some of these parenting observations and it would be fine. Print article This entry was posted by Art Eddy III on May 20, 2013 at 6:00 pm, and is filed under Entertainment. Follow any responses to this post through RSS 2.0. Both comments and pings are currently closed.